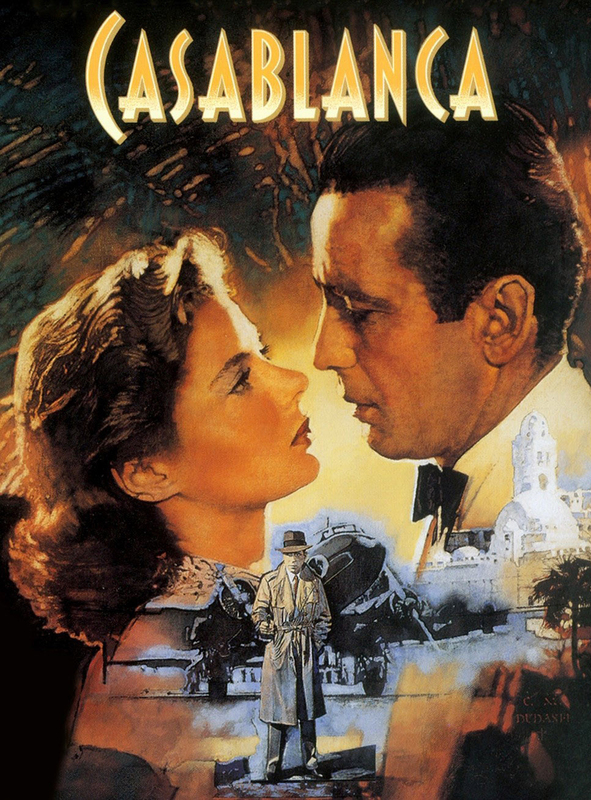 Casablanca, Morocco at the start of World War II: American expatriate and business owner Rick Blaine runs into a long lost love interest, on the run from the Nazis. Rick Blaine is an American that operates the hottest nightspot in French Morocco. Ilsa is his long lost love who just came to town with her rebel husband, Victor Laszlo. With the Nazis hot on their tail, Ilsa must convince Rick to help them get to Lisbon before it’s too late. The plot in and of itself is everything we love about Hollywood and the characters are intriguing with infinite layers of mystery that continue to peel away and reveal something new with each viewing. Historically, the city of Casablanca was a key stop for refugees fleeing from Nazi-occupied Europe and was produced as anti-Nazi propaganda by the first studio to refuse distribution to occupied territories. I first saw CASABLANCA in 2000 as part of a screenwriting class I had to take while attending film school in Vancouver. The instructor idealized the film’s script, dubbing it a “pristine masterpiece” and to this day I consider that screening of the film the only valuable experience I walked away with and while I was mildly entertained by its witty dialogue during that fateful first viewing, the film has gone on to be one of my favorite movies of all time. On top of being one of the most quoted movies of all time, Casablanca appears on multiple top ten film lists from major institutions around the world. Casablanca didn’t go into production as an instant classic but was just another production among many productions the studio had greenlit. 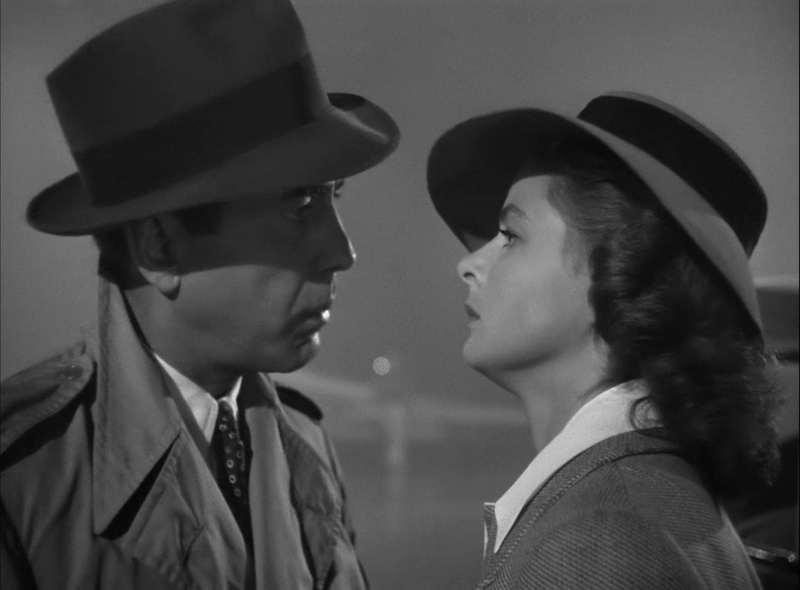 Somehow, someway, Casablanca grew on all of us and became the legendary work that it is today. The film stars Humphrey Bogart and Ingrid Bergman as the top billed leads among a cast of incredibly talented character actors (Paul Henreid, Claude Rains, Conrad Veidt, Peter Lorre). The film is adapted from a previously unproduced stage play called Everybody Comes To Rick’s, written by Murray Burnett and Joan Alison. Producer Hal Wallis, at the urging of Irene Lee Diamond, bought the rights to the play in January of 1942 for $20,000 [us], the most anyone had paid for an unproduced play. Production started on May, 25 1942 after a number of delays and other minor setbacks. Due to the fact that the first act was ready for filming, the movie was largely shot in sequential order and almost entirely in the studio. The only elements shot outside of the studio would be Major Strasser’s arrival to Casablanca, which was filmed at Van Nuys Airport in the valley and bits of stock footage of Paris for the flashback sequences. Due to the nighttime blackout restrictions during the war, the famous tarmac scene was shot inside a studio using a ‘forced perspective’ technique. Production even went as far as to hire little persons as extras to sell the effect. Aside from being one of the most famous scenes of all time, the technical approach is one of the greatest magic tricks ever pulled by a filmmaker. The film’s plot revolves around the central characters’ struggle to obtain Letters of Transit, which had recently been stolen. These ‘letters’ are a fictional device used to motivate the characters, and seem to become irrelevant towards the end of the film when, not a single person is waiting to check for the letters prior to boarding the departing airplane. Playright Joan Alison always said that she expected the audience to challenge her about the letters, but no one ever did. In screenwriting, this device is called a ‘MacGuffin’ and its sole purpose is to motivate the characters when needed. During the course of production, Ingrid Bergman was still learning the English language so she didn’t engage in much conversation with Humphrey Bogart. Rumor has it that they often avoided one-another on set, except when they needed to rehearse or film their scenes. One of the few documented times they met up outside of directly working with one another was when they met to discuss how they both could get out of completing the film (neither liked the project and thought the dialogue to be utterly ridiculous). 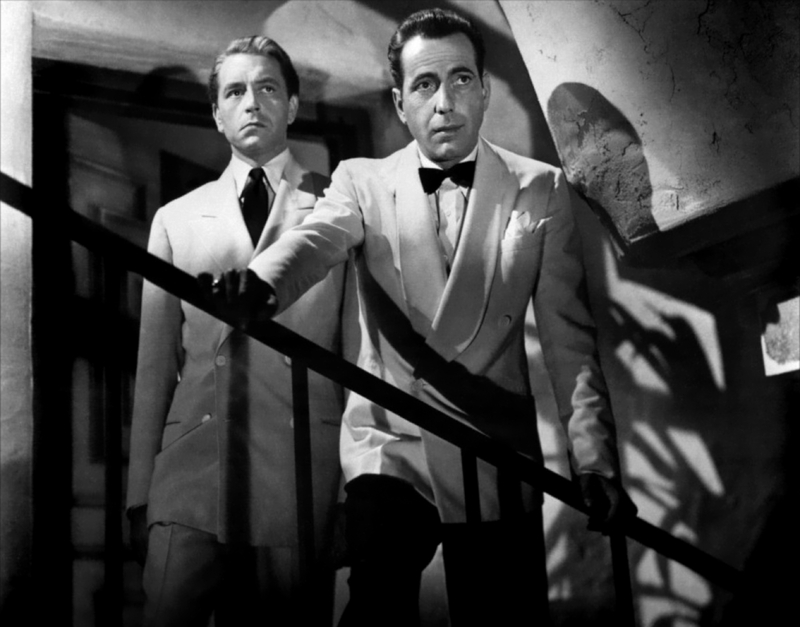 Additionally, Bogart stood 5 centimeters shorter than Bergman, which caused some problems with framing. To compensate for the awkward difference, Bogart had to stand on blocks or walk around in platform shoes. Director Michael Curtiz was close friends with Producer Hal Wallis and was himself a Hungarian Jew who had family that were refugees from occupied Europe. This fact is often taken as one of the reasons the film is so poignant and effective as an anti-Nazi story. There is a famous scene where the French anthem ‘La Marseillaise’ is sung over the german song ‘Watch on the Rhine’. In the scene many of the extras had real tears in their eyes as a large number of them were actual refugees living in America due to the Nazi persecution that was happening in Europe at the time. Arthur Edeson was the cinematographer on the project and had previously worked on The Maltese Falcon and Frankenstein. Considered a pioneer of the craft, Edeson focused most of his attention on the shots featuring Ingrid Bergman. She was shot primarily from her left side (which she preferred). In addition, Edeson utilized a gauze filter to soften her image and placed “catch lights” about the set to help catch the sparkle of her eyes. The end result was that Bergman’s character came off “sad, tender and nostalgic”. Max Steiner wrote the music for Casablanca. Steiner is best known for his incredibly recognizable score for the 1939 classic Gone With The Wind. Although his original GWTW theme is one of the most recognizable in movie history, often the most recognizable parts of the Casablanca music track are not so much his original pieces but the popular songs he didn’t write (Knock On Wood, As Time Goes By, La Marseillaise). Filming wrapped on August 3 and was brought in over budget. While there were plans for pick-up shooting, including a new scene for the ending, the plan was abandoned at the insistence of David O. Selznick who said “it would be a terrible mistake to change the ending.” The ending was kept and the film premiered at the Hollywood Theater in New York City on November 26, 1942 (coinciding with the Allies’ invasion of North Africa and the recapture of Casablanca). The film grossed $255,000 over the first ten weeks (in a single 1500 seat theater) and went on to general release on January 23, 1943, taking advantage of the Casablanca Conference. great article. It’s amazing that it became a classic, considering it was apparently made up as they went along. Also, wasn’t it supposed to star Ronald Reagan? I was just reading about “Casablanca” last night. 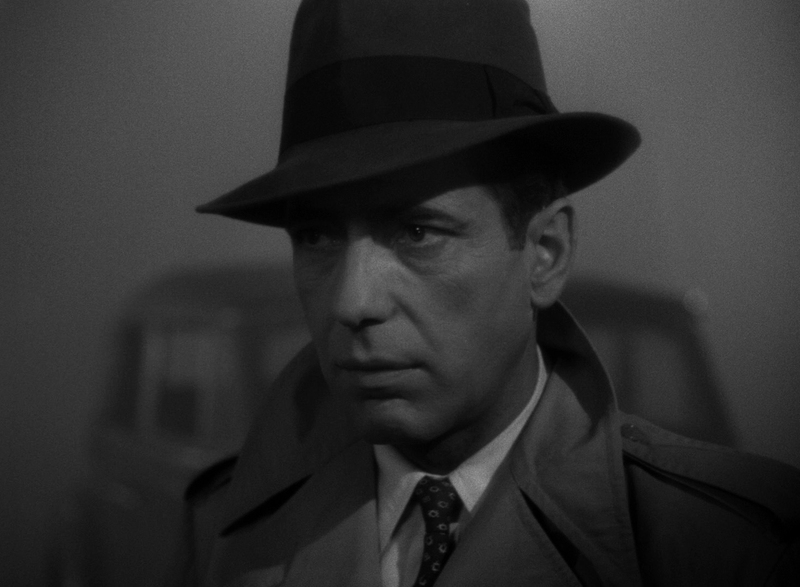 Leslie Halliwell asks a pertinent question about the finale: is there really fog in Casablanca, or was it just Warner Bros. covering up their cheap sets as they were wont to do? A very accurate and informative review as usual Eric. I saw this film over 35 years before you did, and it was already a ‘classic’, even then. 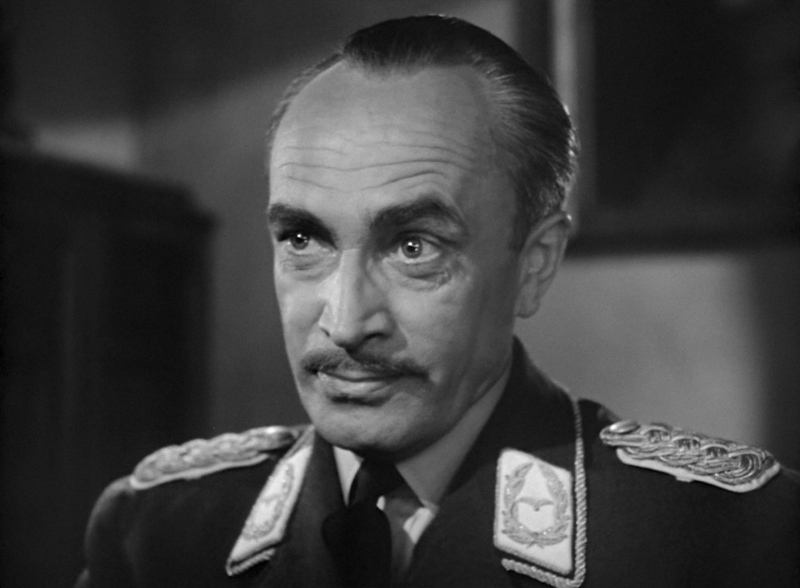 As I got older, I was less impressed by Bergman’s acting, and found many things to irritate, after frequent viewings. For me, the film stands on its amazing lighting, and the performances of the marvellous supporting actors; with the whole package just about qualifying it for the iconic status it holds in cinema history. ‘As Time Goes By’, the famous song from the film, is known by almost anyone with the remotest interest in cinema, and even young people can quote lines from it, without ever having seen it. Enough said. Yet another oldie I have to watch. There are so many classics I’ve not seen, I feel almost criminal! One thing I’ve noticed after multiple viewings, which might be what you’re noticing with Bergman’s acting, his her possible struggle with the language. I hadn’t initially been informed that she was struggling with it during production and thought some of the nuances in her performance were trivial, that is until I started watching it with this knowledge. I tried watching this once, and only made it through about 20 minutes – I was frustrated by the cheesy romanticism and the gauzy way that Bergman was filmed. I was always under the impression that it became a classic because of the romantic aspects, and also because WWII was the last “satisfying” war the U.S. fought. I enjoyed this article, though – it seems the back story of the film is just as (if not more) interesting than the film itself! Hi Eric, and whoa! I feel like I’ve somehow offended you, even though I was not trying to do that at all! I completely agree that getting to know the production history of a film is both fascinating and can add a whole new level of understanding to one’s analysis & appreciation of a film. Really, I was trying to congratulate you for doing that! I was also trying to point out that it’s a shame that my impression of the movie isn’t positive, mostly because immature girls in my high school would discuss it alongside “Breakfast at Tiffany’s” and “Titanic.” I think that colored my first (incomplete) viewing of the film, and your writeup actually makes me want to watch the whole thing with a fresh mindset.